Crop harvest season approaches, around my home town Yakage the sparrows eat the rice paddies. Neighbors are making a scarecrow or use a gas gun. Since commercial gas gun is too loud, I decided to make a replacement for it. It should be useful where there is no AC100V. Please note the selection of the installation location enough so that this sparrow's threat may generate the noise. Those who set it up must do this management by own responsibility. Even if the problem occurs, I am not concerned at all. I think that I can make it at once if parts become complete because parts on the market are the majorities. The bell rings because of a big sound for five seconds every ten minutes only in daytime. However, it seems to be very effective only though is this. The diode of the power supply is for the power supply reverse-connection protection. Please use the one of about 1A or more of the silicon diode. CdS and the circuit of two transistors are the circuits operated only in daytime. After it sets it up, anything is never done. CdS was taken from the useless article of the flasher for the street light and used. The power supply is a battery for the car of 12V. You will charge it ahead of time though it operates for months. 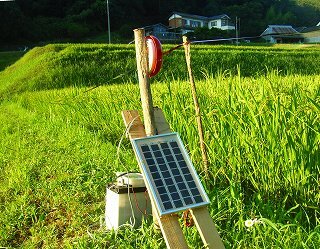 Because I am using it together with wild boar's electrified fence, it charges it once every two weeks. The average current on operation of daytime is 20mA or less. The current at nighttime is almost 0. Moreover, please put the fuse of about 1A in a place near the battery though it is not in the schematic diagram. 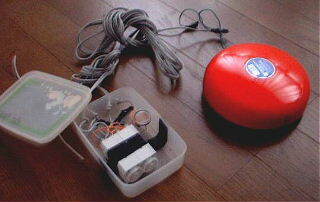 The device and the circuit put in tupperware are made wiring in the air. After it produced it in the summer of 2000, I used it for a long time. There is no trouble at all. The power supply is a battery for the car. It is a solar battery of 3W because it assumes it is maintenance free solar battery is installed. The inclination of solar is quickened a little so as not to become an overcharge. I do not think that there is worry of the overcharge because the power generation capacity of the average is 1W or less. 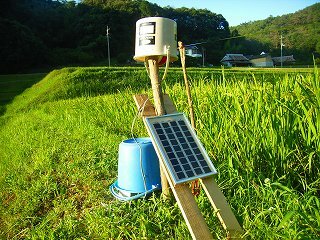 The plastic bucket is taken like seeing this photograph. It keeps inverse and it covers the bell, the electric circuit, and the battery with the plastic bucket where light is passed a little to be unquestionable even if rain hangs. The bucket is bound to the prop with the wire so that it doesn't fly because of the wind. At present, there is little damage.